The Mycenaean Civilization (approximately 1900-1100 BCE) is commonly acknowledged as the beginning of Greek culture, even though we know almost nothing about the Mycenaeans save what can be determined through archaeological finds and through Homer’s account of their war with Troy as recorded in The Iliad. They are credited with establishing the culture owing primarily to their architectural advances, their development of a writing system (known as Linear B, an early form of Greek descended from the Minoan Linear A), and the establishment, or enhancement of, religious rites. The Mycenaeans appear to have been greatly influenced by the Minoans of Crete in their worship of earth goddesses and sky gods, which, in time, become the classical pantheon of ancient Greece. The gods and goddesses provided the Greeks with a solid paradigm of the creation of the universe, the world, and human beings. An early myth relates how, in the beginning, there was nothing but chaos in the form of unending waters. From this chaos came the goddess Eurynome who separated the water from the air and began her dance of creation with the serpent Ophion. From their dance, all of creation sprang and Eurynome was, originally, the Great Mother Goddess and Creator of All Things. By the time Hesiod and Homer were writing (8th century BCE), this story had changed into the more familiar myth concerning the titans, Zeus' war against them, and the birth of the Olympian Gods with Zeus as their chief. This shift indicates a movement from a matriarchal religion to a patriarchal paradigm. Whichever model was followed, however, the gods clearly interacted regularly with the humans who worshipped them and were a large part of daily life in ancient Greece. Prior to the coming of the Romans, the only road in mainland Greece that was not a cow path was the Sacred Way which ran between the city of Athens and the holy city of Eleusis, birthplace of the Eleusinian Mysteries celebrating the goddess Demeter and her daughter Persephone. By 1100 BCE the great Mycenaean cities of southwest Greece were abandoned and, some claim, their civilization destroyed by an invasion of Doric Greeks. Archaeological evidence is inconclusive as to what led to the fall of the Mycenaeans. As no written records of this period survive (or have yet to be unearthed) one may only speculate on causes. The tablets of Linear B script found thus far contain only lists of goods bartered in trade or kept in stock. No history of the time has yet emerged. 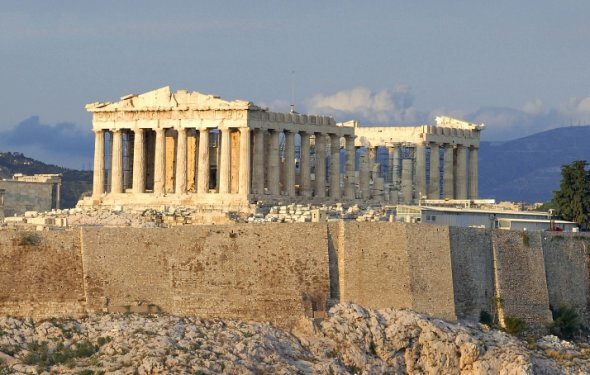 It seems clear, however, that after what is known as the Greek Dark Ages (approximately 1100-800 BCE, so named because of the absence of written documentation) the Greeks further colonized much of Asia Minor, and the islands surrounding mainland Greece and began to make significant cultural advances. Beginning in c. 585 BCE the first Greek philosopher, Thales, was engaged in what, today, would be recognised as scientific inquiry in the settlement of Miletus on the Asia Minor coast and this region of Ionian colonies would make significant breakthroughs in the fields of philosophy and mathematics. The Sticker size is 15 X 8,67 Inches. Metric size (cm) 38,1 X 22 cm. The Sticker size is 10 X 6,79 Inches. Metric size (cm) 25,4 X 17,2 cm. The Sticker size is 18 X 15,2 Inches. Metric size (cm) 45,7 X 38,7 cm. The Sticker size is 18 X 10,0 Inches. Metric size (cm) 45,7 X 25,6 cm. The Sticker size is 9 X 8,93 Inches. Metric size (cm) 22,9 X 22,7 cm. Vladimir Sergeyevich Sergeyev (Russian: Владимир Сергеевич Сергеев) (June 28, 1883 N.S. - January 8, 1941 in Moscow) was Soviet historian of classical antiquity. Grzegorz Lach (b. 1967) is a Polish historian. He finished history at Silesian University in Katowice, where in 2007 he gained a Ph.D. His research area is ancient Greece and he is well known author of books about this topic.